Black and white allows you to easily match other decorations and accents throughout the celebration. This cake can look many things, depending on how it is designed, including elegant, modern, sophisticated and stunning. White wedding cakes are the traditional choice, but for brides who just want to spice it up a little, black can be very stunning. 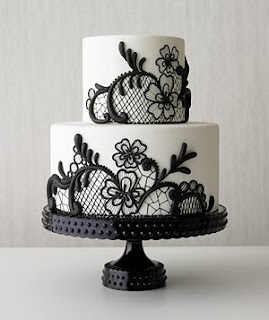 For those brides who still want it mostly white they can have slight accents of black such as adding dots or swirls to the cake, but leaving it mostly white. Many brides and grooms choose to evenly distribute the black and white on their wedding cake. One way to do this is to alternate the color of each tier of the cake. Other popular trends for black and white wedding cakes include having designs or patterns on the cakes. As mentioned before this can be quite simple such as dots (polka dotted themes are always popular) to stripes, lines, and swirls. Hearts and other geometric objects are also quite popular. Sometimes you will see other designs such as intricate leaves, flowers, ribbons or even a specific picture painted on the cake. If you want a black and white cake but are still looking for a touch of color, that can be done too. You might decide to use flower petals either directly on your cake or artfully positioned on the cake table. If you like the idea of color but you don't want flowers, you can ask your baker to see samples of where they blended in small amounts of color into the cake design. If you do decide to go with a black and white wedding cake, you are going to want to make sure that the cake topper and any other cake decorations you choose go with the rest of the look you have created. Many people would tend to stay away from a topper or cake jewelry which is overly colorful, as it might clash with the actual cake. 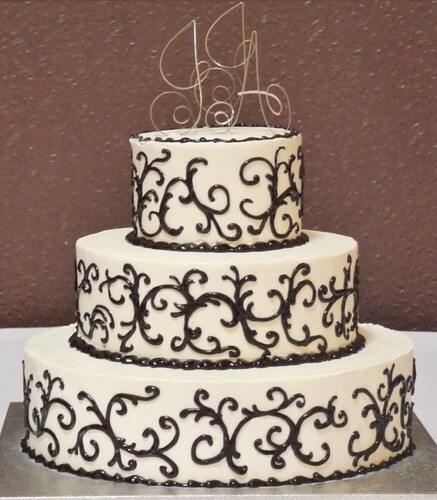 The black and white wedding cake is a popular choice among brides and grooms in all types of weddings. If you do decide this is the color scheme for you, make sure it matches the rest of your day, including your color schemes and decor. Whereas black and white is beautiful, you do not want it to look like it is at the wrong wedding.